All organic matter in your garden eventually decomposes. Composting speeds the process by providing an ideal environment for bacteria and other decomposing microorganisms do break down the organic garden matter. The final product, humus or compost, looks and feels like fertile garden soil. This dark, crumbly, earthy smelling stuff works wonders on all kinds of soil and provides vital nutrients to help plants grow and look better. Decomposing organisms consist of bacteria, fungi, and larger organisms such as worms, sow bugs, nematodes, and numerous others. For best results, mix materials high in nitrogen (such as clover, fresh grass clippings, and livestock manure) and those high in carbon (such as dried leaves and twigs). If there is not a good supply of nitrogen-rich material, a handful of general lawn fertilizer will help the nitrogen-carbon ratio. Moisture is provided by rain, but you may need to water or cover the pile to keep it damp. Be careful not to saturate the pile. 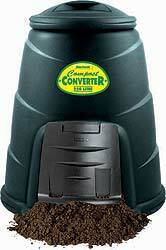 Turning or mixing the compost provides oxygen. Frequent turning yields faster decomposition. dog or cat manure - they can carry diseases. Composting can be as simple or as involved as you would like, and depends on how much yard waste you have, how fast you want results, and the effort you are willing to invest.